Dendermonde (Dutch pronunciation: [ˌdɛndərˈmɔndə], French: Termonde) is a Belgian city and municipality located in the Flemish province of East Flanders in the Denderstreek. 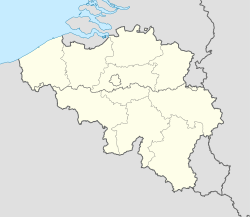 The municipality comprises the city of Dendermonde proper and the towns of Appels, Baasrode, Grembergen, Mespelare, Oudegem, Schoonaarde, and Sint-Gillis-bij-Dendermonde. Dendermonde is located at the mouth of the river Dender, where it flows into the Scheldt. The town has a long-standing (folkloric) feud with Aalst (situated south along the same river), which dates back from the Middle Ages. The city is an administrative, commercial, educational, and medical centre for the surrounding region. The current Mayor of Dendermonde is Piet Buyse (Christian Democratic and Flemish). Some interesting La-Tène artifacts were found in Appels, proof that this region of the Scheldt was inhabited in prehistory. Grave sites from the 2nd and 6th century also attest to dense settlement in Gallo-Roman and Merovingian times. In 843, the Treaty of Verdun placed Dendermonde in Lotharingia. After the Norman invasions of 883, however, Baldwin II took over the region and incorporated it into the German part of the newly founded County of Flanders. Otto II built a fort here in the 10th century, encouraging further settlements in the area. The town received its city charter in 1233 and grew quickly after that thanks to a thriving cloth industry. Several cloisters, chapels and churches, and a fortified defensive wall were built as well. A cloth hall and belfry were erected on the market square in the mid 14th century. The town’s prosperity, however, gave rise to severe competition with cities such as Ghent and to occasional attacks and plunders by neighbours. In 1384, the whole area came under the control of the Valois dukes of Burgundy. The 16th century saw a decline in Dendermonde’s fortunes. In 1572 Dendermonde was conquered by William the Silent. The same year however Spanish troops under Duke Alexander Farnese of Parma, took over the city, looted and mostly destroyed it. A decade later, the Spaniards built their own fortress between the Dender and the Scheldt. In 1667, it was France’s turn to advance on the city, but the allied troops of the Netherlands and England, under the Duke of Marlborough, caused the heaviest damage in 1706. The city was then fortified by the Austrians against further French ambitions. After a last siege by Louis XV, the city could finally breathe to the point that the fortifications were dismantled a few decades later. The second half of the 18th century was generally prosperous, with the advent of the Industrial Revolution and a local cotton industry. After 1800, the port facilities were modernized and the first railways were laid down, allowing other industries (oil, shoe, leather…) to move in. The onset of World War I in September 1914 was disastrous for the city as more than half of its housing and the city archives were either bombed or burned down. On August 19, 2006, 28 prisoners managed to escape Dendermonde prison. Seven of them were captured within hours. A few have been found in Italy and Russia. They managed to escape because the lock was old and rusty. They simply walked away, tied all their sheets together, climbed over the wall, jumped on a phone booth and ran away. On 23 January 2009, a 20-year-old Flemish man named Kim De Gelder attacked a children's daycare centre in the village of Sint-Gillis-bij-Dendermonde, stabbing three people to death and wounding as many as twenty. One of the school teachers and two babies, aged 8 and 9 months, died in the attack. Italian singer Luciano Ligabue dedicated a song to the victims: Quando mi vieni a prendere? (Dendermonde 23/01/09), inserted in his 2010 album, Arrivederci, Mostro!. The béguinage is a UNESCO World Heritage Site since 1998. The city hall and belfry have also been designated a World Heritage Site since 1999. The belfry houses a carillon and was formerly part of the Cloth Hall. Dendermonde has a Benedictine abbey, famous for its library containing an original manuscript of Hildegard of Bingen, called the 'Dendermonde Codex'. The Dendermonde-Puurs Steam Railway is a heritage railway, running 14 kilometres (8.7 mi) from Dendermonde to Puurs. Dendermonde likes to be known for its decennial procession, featuring the heroic horse, Ros Beiaard. Legend has this horse saving his master and his three brothers from capture by Charlemagne. Dendermonde is home to Rugby Union club Dendermondse RC, champions of the Belgian Elite League in the 2011/12 season. ^ "Wettelijke Bevolking per gemeente op 1 januari 2018". Statbel. Retrieved 9 March 2019. ^ "Five dead in knife attack at Belgian creche". Telegraph.co.uk. Jan 23, 2009. Retrieved May 17, 2010. ^ "Quando mi vieni a prendere? (Dendermonde 23/01/09)". Ligachannel (in Italian). April 26, 2010. Retrieved May 17, 2010. Wikimedia Commons has media related to Dendermonde.